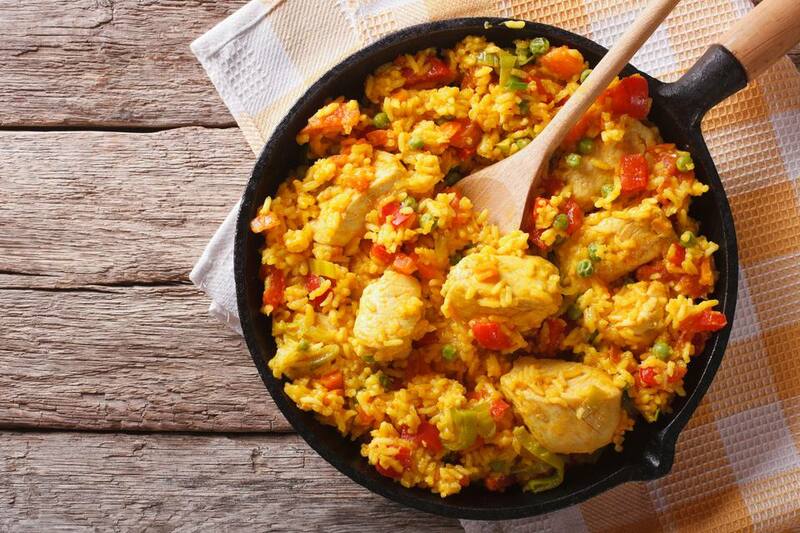 Arroz con pollo, which means rice with chicken, is similar to paella. It is a classic chicken and rice dish popular in many Latin American countries and parts of the US. This is a Spanish version with saffron, along with chopped pimientos and tomato sauce. This version is made with chicken parts, but feel free to use boneless chicken thighs in the recipe. Chop the celery into 1/4-inch pieces. Slice the bell pepper in half lengthwise and remove the seeds. Chop the pepper into 1/4-inch dice. Peel and chop the onion. Mince the garlic. Set the vegetables aside. Place a large, deep, heavy skillet over medium heat. Add the vegetable oil. When the oil is hot and shimmering, arrange the chicken pieces in the pan. Cook the chicken, turning until browned on all sides, about 12 to 15 minutes. Remove the chicken to a plate and set aside. Leave about 2 tablespoons of oil in the pan; discard the remaining oil. To the skillet add the celery, bell pepper, and onion. Saute for about 3 minutes. Add the garlic and saute for another minute. Add the rice, tomato sauce, water, saffron, 1 teaspoon of kosher salt, and about 1/4 teaspoon of freshly ground black pepper. Stir to blend and then add the chicken back to the skillet. Bring to a boil, reduce the heat to low, cover the pan, and cook for 20 to 30 minutes, or until the rice is tender. Fluff the rice with a fork. Taste and adjust seasonings with more salt and pepper, as needed. Stir in the pimiento and heat for another minute or two.